The bird cherry oat, English grain, greenbug, and corn leaf aphids are the most important species in Kentucky wheat fields. They are the key pests on wheat grain production for their role as vectors of Barley Yellow Dwarf Virus (BYDV). Bird cherry oat and English grain aphids overwinter as nymphs or adults, and they can start feeding (and potentially transmit viruses) when temperatures are above 45º F. They start probing plants when temperatures are greater than 45ºF. At constant 50ºF temperatures, these aphids may complete their life cycle in 28 to 30 days, whereas at 77ºF, the life cycle can be shortened to approximately 8 days. Below 45ºF, aphids are inactive, lethargic, and sheltered in soil crevices near the bases of wheat stems. 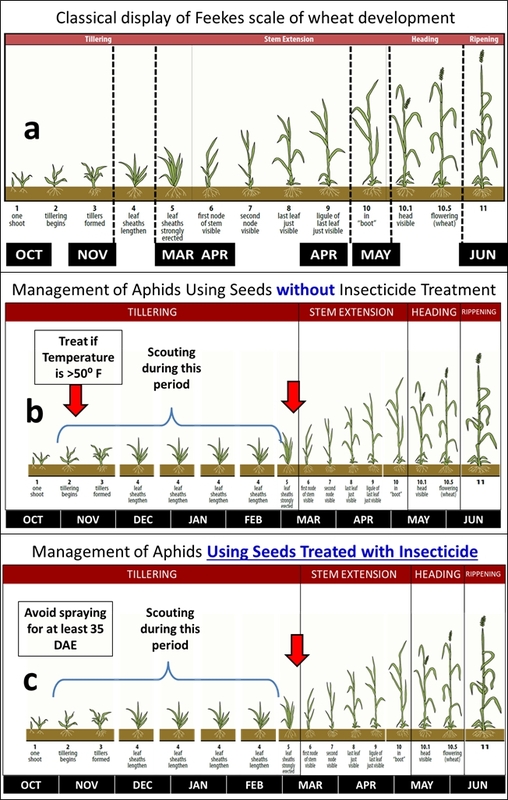 On wheat plants grown with insecticide-treated seeds (Figure 1c), insecticide sprays should not have been applied for at least 30 to 35 days after plants emerged (DAE). Insecticides on seeds should keep aphids at low numbers even if temperatures were greater than 50⁰F by mid-November or December. In these plants, a spray might be applied in early or mid-March only after tallies have shown that the mean numbers of aphids are greater than or equal to 10. These potential sprays are represented by the arrow in Figure 1c. After the period described above, any growers should consider the threshold (greater than or equal to 10 aphids), and scouting should be conducted for plants grown with and without insecticide seed treatment.